Did I follow this sage advice during the past hectic week? I am proud to say that I did. I did not buy or sell a single stock or ETF during the mayhem leading up to the U.S. debt deal, the ratings downgrade and the subsequent crazy rumors about French debt. Moreover, my investments are 1) in positive territory for the year (not by a whopping amount, but anything is good enough) and 2) well above the S&P 500. 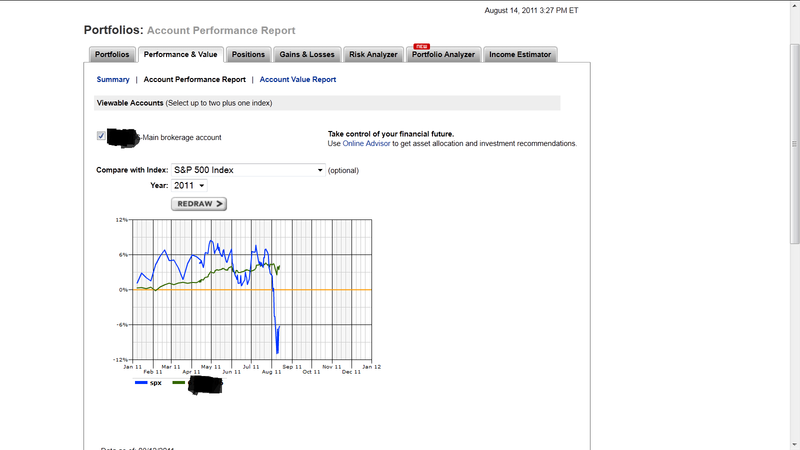 Here is the chart comparing the overall market and my personal performance. 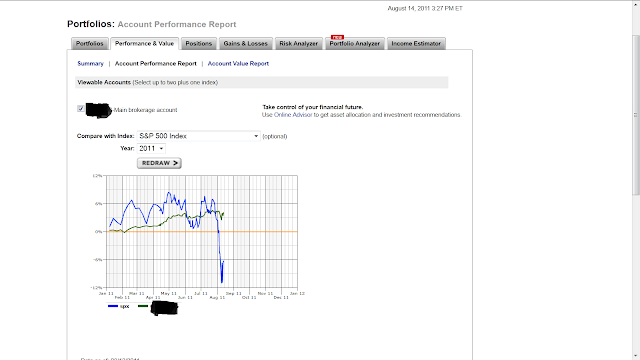 My portfolio is the green line! The depressing blue line is what the U.S. stock benchmark is providing an investor who jumped into the market January 1st. Don’t overtrade. That increases costs and the yearly tax bill. Invest in passively managed funds and ETFs instead of actively managed funds where the manager takes a massive cut from your gains. Never buy or sell when in an emotional state. Don’t double down on bad investments (there is a lot of literature on the pernicious effects of “averaging out” and the “sunk cost fallacy” from behavioral economics). But above all the best lesson from people like Buffett is good old-fashioned Midwestern independence of mind: think for yourself. The standard wisdom from every two-bit investment advisor for a person my age is that I should have a larger proportion of my savings in stocks rather than bonds because of the greater long-term potential of equities. The problem is I sat through the grinding summer of 2007, when the experts were telling us that this was the “kitchen sink” quarter and that after that it would be plain sailing for Citigroup, (ahem) Bear Stearns and the like. But the next quarter they would uncover another hectare of rotten, decomposing, previously undisclosed holdings of subprime mortgage crap worth another $10 or $15 billion in “oopsies.” I finally got fed up and shifted massively to fixed income, and I never looked back. Of course, I still retain a slight 20%-25% exposure to stocks in case the world economy ever recovers, but on the whole I enjoy getting my boring little dividends on my bond ETFs every month just fine, thank you very much. Barring the massive 2009 upsurge in stocks, I regularly beat the market… and sleep better too. Best advice I ever got (from a gazillionaire): "I never made money selling at a loss"